This exceptional tapestry “Archway to Venice” shows a scene of Venice's magical waterways. The city of canals is seen here beautifully framed by one of its archways. The gorgeous color in each home is unique, and the boats and gondolas are seen moored by the sides of the homes. An elegant cafe is seen on the right. The bridge, which is seen here in the midground, is typical of the many bridges used for crossing the canals, of which there are 177, separating 177 islands, on which there are 409 bridges. Venice was thought to be formed at the time of ancient Roman empire and was officially founded in noon on 25th March 421. The use of color and light as well as composition is superb in this tapestry and shows the glorious drama of the water city stunningly in this piece. 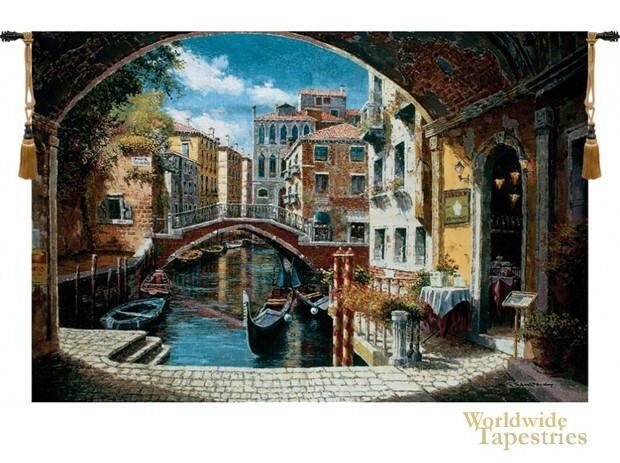 This cityscape tapestry “Archway” is lined and has a tunnel for easy hanging. Note: tapestry rod and tassels, where pictured, are purchased separately. Dimensions: W 71" x H 48"